So far, we have identified 18 buildings among Douglas Emmett’s office portfolio that feature a version of the sticker above. Readers can now search in the Building Database to see which are “Prop 65” buildings. Our interactive map is available below. Click on a building to see data on Prop 65, leases, litigation, building permits, ownership, financing, environmental reports, and the identity of property management, among other publicly-available information. California’s Office of Environmental Health Hazard Assessment (OEHHA), which is a part of the California Environmental Protection Agency, offers a useful primer on the voter-approved Proposition 65. 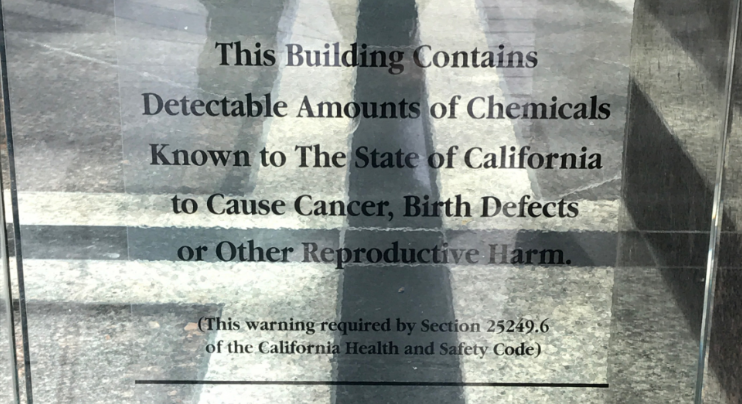 The Prop 65 sticker on Douglas Emmett buildings does not, to our knowledge, specifically identify the relevant chemical(s) in any given building. Environmental site assessments and investigations have identified twenty-five buildings in our Consolidated Portfolio, and four buildings owned by our unconsolidated Funds which contain asbestos, and would have to be removed in compliance with applicable environmental regulations if these properties are demolished or undergo major renovations. DE-Tenants.org is currently working to identify which buildings in Douglas Emmett’s commercial portfolio contain asbestos. Look for more research shortly.